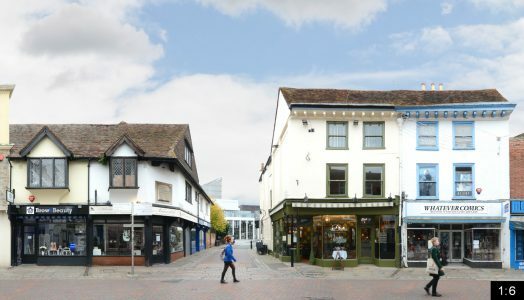 A 3-street-blocks panorama of St Peter’s Street in central Canterbury. [click the panorama image for a zoom] The historical city in England’s south-eastern county Kent is known for its religious importance and its largely preserved old town. Though also heavily hit by the german Blitz in world war II a number of its timber framed houses have survived, most notably the Old Weavers House in St Peter’s Street at the right edge of this streetview. The street is named after St Peter’s church, which you can see at the left edge of this panorama. 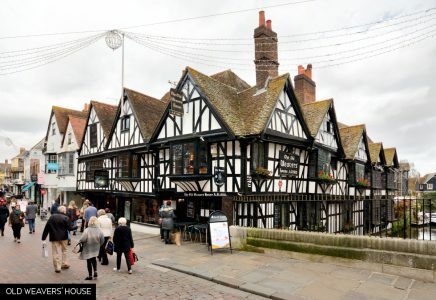 It starts as the extension of the High Street on the right side and runs up to the Westgate of Canterbury. Probably the most photographed building in Canterbury is the Old Weavers House, which you can see with its street front in the panorama, but it has an even longer front running along the River Stour below the bridge (see detail image on the right side). 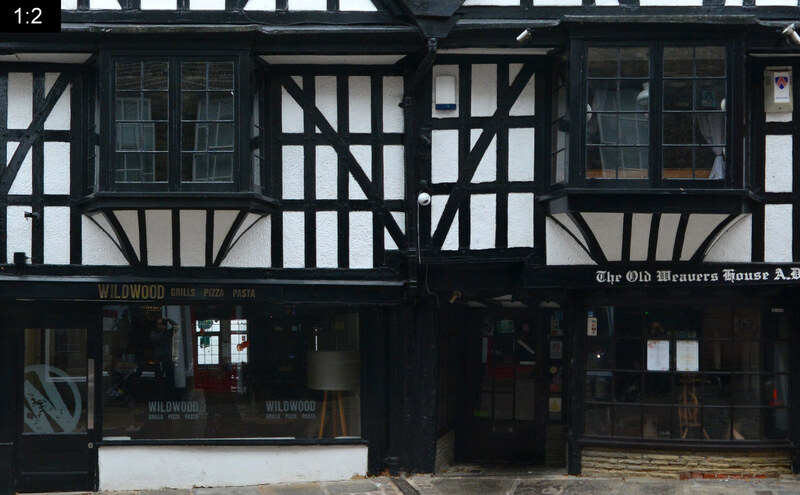 The building is named after the Flemish and Hugenot weavers who fled from religious persecution in the 16th/17th century and settled in the area. 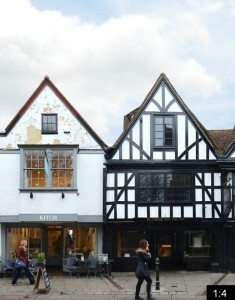 As an extension of the High Street, naturally the buildings in the street are all used for commercial purposes and so we see several shops, cafés and restaurants. 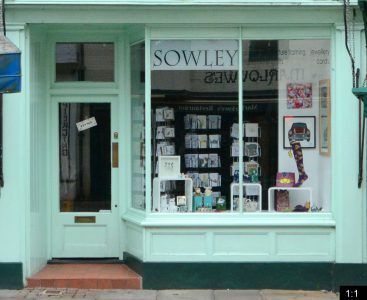 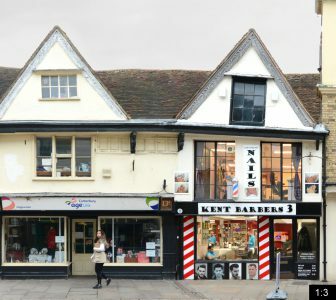 These include for example Kent Barbers, Beauty and Nails shops, Dems Restaurant, Whatever Comics, the Sowley arts shop, a bakery, a belgian chocolates shop, the Children’s Trust, the Kitch café and Wildwood restaurant inside the weavers house. 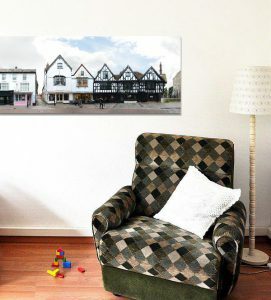 St Peter’s church at the left edge dates back to the 12th century, supposedly it is built on top of a very early roman church. 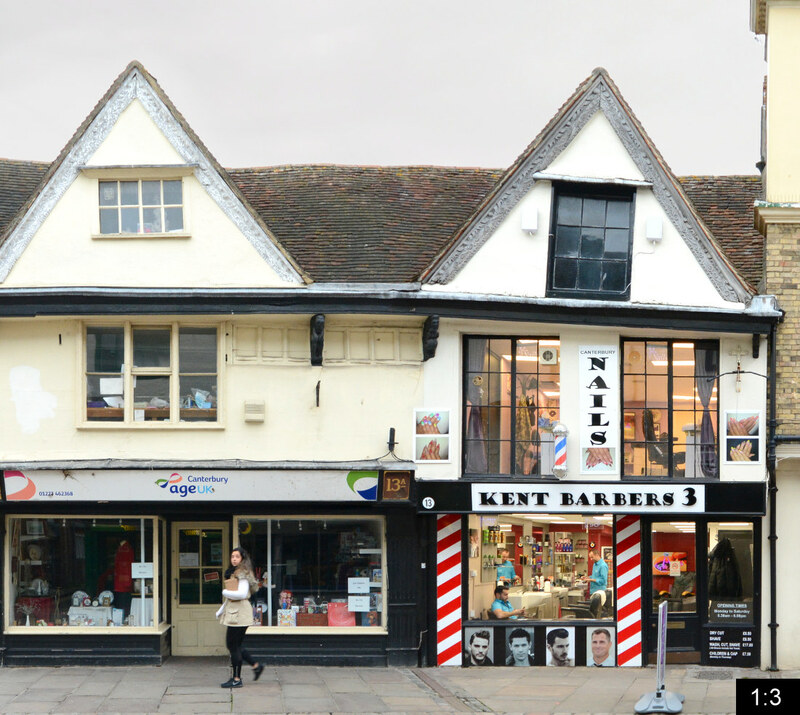 This streetview panorama of Canterbury was presented in week 23 of our 101 weeks 101 cities of europe project, together with more streetline previews of Canterbury.